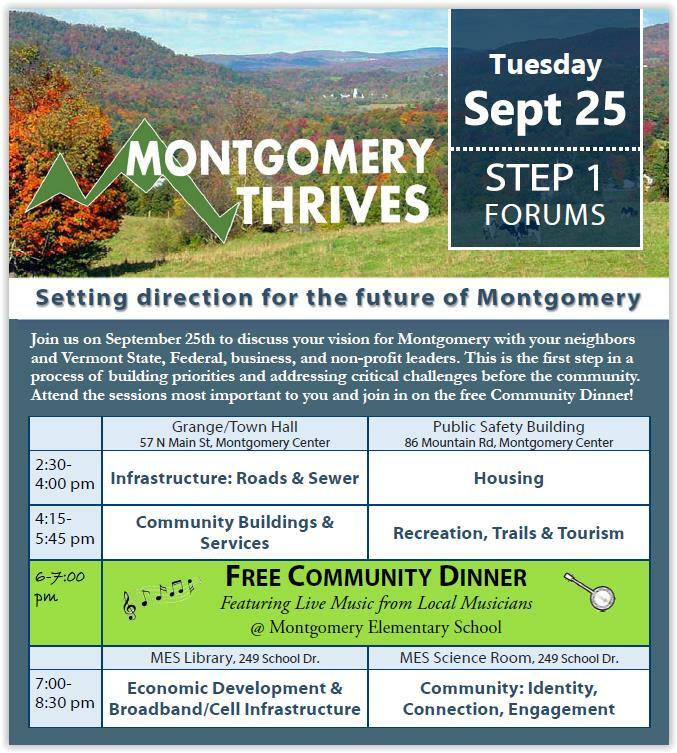 On Tuesday, September 25, 2018, all members of the Montgomery community are invited to participate in a series of forums in town to share their concerns and ideas. VCRD will bring a team of federal, state, business, nonprofit, and philanthropic leaders who will listen to residents and will return in months ahead to the community with recommendations, ideas and support in developing action plans and funding strategies. Click HERE for the schedule of the day. The forum sessions for discussion on the 25th will include: Infrastructure: Roads & Sewer; Housing; Community Buildings & Services; Recreation, Trails & Tourism; Economic Development & Broadband/Cell Infrastructure; and Community: Identity, Connection, Engagement. For more information or to get on our email list for the schedule announcements, contact us at info@vtrural.org or 802-223-6091, and visit the Montgomery Facebook Event.